My husband and I like a clean house. We’re not crazy everything has to be its place kind of people, but we’re not big fans of dirt, dust and clutter … or animal hair. And since we have two cats and a dog, that last one is sometimes kind of difficult to keep under control. On top of that, both of our parents have allergies to our animals so it is important for us to keep the house clean and somewhat free of dust and dander. After our son was born and I went back to work part-time my mom and mother-in-law watched him on Tuesdays and Thursdays, so I would spend all day Monday cleaning in between nap time and play time. I hated Mondays. I always felt so exhausted and felt like I wasn’t able to devote enough time to my son and cleaning the house. I know what you’re thinking—why not just let the housework go?! Doesn’t your husband help?? Well, since our parents are allergic to the animals, I thought it was really, really important that I mop and steam every week to keep the dander down. And yes, Dennis does help. He helps a lot. (Although he doesn’t clean the bathrooms. Can’t he just clean one bathroom?? I mean, he’ll clean the whole house, but he won’t touch the toilet! ... but he does help). Also for some reason, I had it in my head that since I was staying home, it was my job, even though he told me repeatedly that I didn’t have to do anything but lay around with the baby. After a while, I just couldn’t keep up. It wasn’t just MY job. I was exhausted, I was angry, and my house wasn’t clean. These guys are cute, but they sure do leave a lot of hair and vomit all over the place. 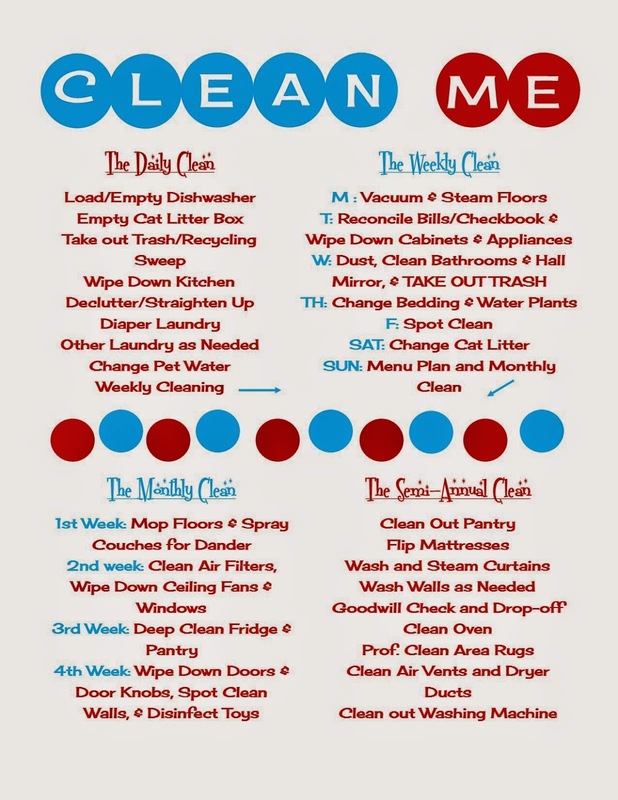 One of the ways we have been able to divvy up the chores, keep a clean house, and stay sane since our son was born was to develop a cleaning chart. I took some inspiration from Pinterest to come up with a cleaning list that suits our home and schedule. I divided the chores into daily, weekly, monthly, and semi-annual chores and designed the chart in Microsoft Publisher. This can be easily done in Word or any type of printing program as well. If you don’t have access to Word at home, your local library probably has a computer you can sign up to use. There are also a number of free and purchasable printables on the interwebs or feel free to download this printable and use it in your home. I printed ours out at Office Max (it’s the closest), framed it, and hung it in the kitchen. We use a wax pencil or wet-erase marker to check off the chores when they are done. So simple—anyone can do it! The printable is formatted in 8.5 x 11. If you have an 8 x 10 frame, simply trim 1/4-inch off of the sides and 1/2 inch off the top and bottom. When I was nursing, my husband would usually finish the daily chores while I was feeding and putting our son to bed. When I was done, I came out and helped finish up the daily chore and the weekly chore if it hadn’t already been done. Now, that Weston is bottle feeding, we usually switch off who puts him to bed and the other comes out to help when they’re finished. We are both people who like completing jobs and checking things off a list, so this has really been great way to for us to feel accomplished around the house! We tend to both do the monthly and semi-annual chore but you really can split it up either way. Sometimes, if I’m lucky, Weston will take a glorious two hour nap and I can get some stuff done during the day. Other days, he’ll take a not-so-glorious 30-45 minute nap and I’m lucky I can get the dishes into the dishwasher. When our son is older, we’ll assign him some light house-keeping duties and he’ll get to participate too! I am sure he will be thrilled. I should note that although we have this chart hanging in our kitchen and try to accomplish our chores daily, sometimes it just doesn’t happen. And that’s okay. As parents, it’s important to remain flexible. If you don’t get something done, it’s not the end of the world. Cuddling with your babies, helping your kids with their homework, and relaxing are all very important parts of our daily lives and sometimes, you just flat out don’t want to clean! We try to keep up as best we can and don’t beat ourselves up about it. When creating your cleaning list there are a few things you’ll want to keep in mind. Your family schedule. Is there a day or two that is just too hectic to even think about adding additional to-do’s to the list? Kids swim lessons? Night class? Then don’t schedule any chores for that day and see where you can fit them in later in the week. It’s best not to schedule extra work on those days because it will just stress you out even more. It is important to find time to do what needs to be done but you should also be practical. Just add an additional chore to a day that doesn’t have too much going on all already. Can the kids help? If your children are old enough to participate in helping around the house, think about adding a section for “daily kid’s chores.” It’s a great way to teach them about responsibility and accomplishment. Is there something that you are always forgetting to do? Put in on the list so you remember! For me, this was cleaning out the litter box. Ugh, gross, I know. But now that we have it on the list it (almost) always gets done! Have fun and be creative. Choose colors that match your kitchen. Add some fun clip-art. Add glitter. Paint the frame a fun color. Use fun fonts (I used this free font). Get creative and make it part of your home. That way, even if you dread doing your chores, you'll at least like looking at your chart! How do you and your family divvy up the chores? Leave your tips and ideas in the comments below. We’d love to hear them! We could really use this chart!